Dahi Wala Khatta Chicken recipe by Rania at DesiRecipes.com. 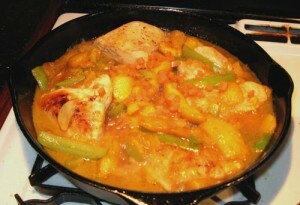 A unique style of Chicken marinated and cooked in mango, yogurt and spices. Marinate chicken with mango paste, ginger /garlic paste for 1 hour. In a pan heat oil, fry onion till golden brown. Add tomatoes & green chillies and cook for 3-4 min. Add all masalas and saute for 2 min. Then add marinated chicken , put some water and cook till chicken is tender. Garnish with chopped raw mango pieces. Dont use non stick pan for sour dishes. There are 2 comment(s) for this recipe.